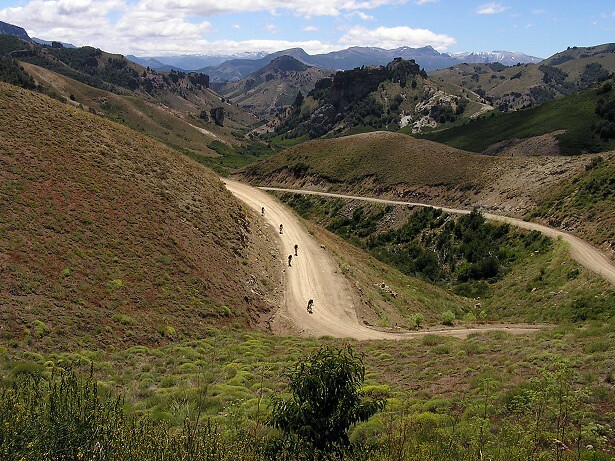 Ride your mountain bike through the different cultures and landscapes of the Lakes District of Northern Patagonia. 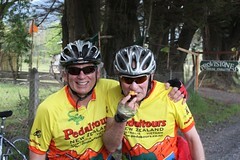 Argentina and Chile are separated by the high Andes Mountains and this makes for very dramatic changes as we cycle. 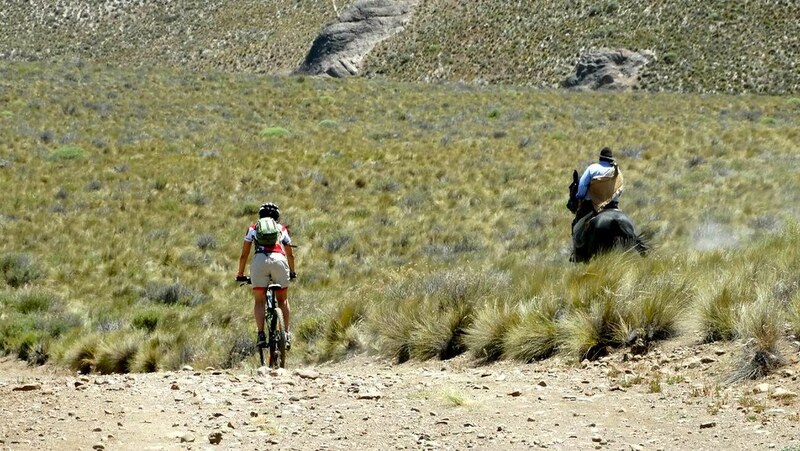 In a biking vacation of 8 days, you will cycle through a very diverse region of South America; from the dramatic steppe of Argentina where the Andean Condors nest, to the lush rainforest and of Chile, you will navigate around the lakes and gravel roads from the Andes mountains to the Pacific Ocean. Enjoy the local wine and cuisine while taking in the majestic view of 3 volcanoes: Lanin, Choshuenco, and Villarica. There are many natural hot springs and thermal baths along the way to soak tired legs!. Day 1: Welcome to Bariloche! 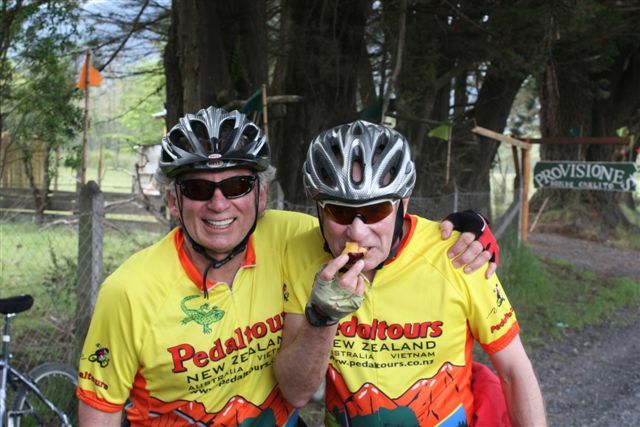 Your cycling guides will pick you up in the Bariloche airport and show you a bit of our beautiful town. 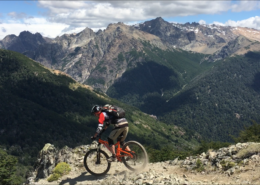 San Carlos de Bariloche, the “South American Switzerland”, is a beautiful spot to start your South American mountain biking vacation! This mountain town is located on the shore of the huge Nahuel Huapi Lake, and it is no wonder that Argentina declared the surrounding area it’s first national park, the Nahuel Huapi National Park. Briefing of the trip with the whole group. Tonight we’ll enjoy a welcome dinner at a local parrilla, grill/BBQ, with authentic asado, grilled steak, and great Argentinian wine. Night in a cozy hosteria (3 stars). We drive for 20km out of the town of Bariloche. Prepare our bikes for a nice and smooth dirt road cycling along the turquoise-colored Limay river. We will pass through beautiful Estancias and Gaucho farms. See the Argentine ranch culture of cattle, horses, and sheep. If we are lucky, maybe we’ll spot a guanaco on the way in its wild environment or a giant condor’s nest. 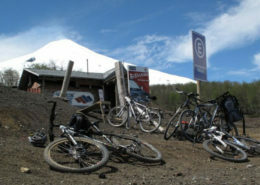 We will end our bike ride at the tiny town of Villa Llanquin and drive to the junction of the rivers Limay and Traful. In this remote area, we spend the night in a locally owned hosteria with an incredible view of the volcanic rock towers of Valle Encantado, “The Enchanted Valley”. Night in Hosteria (2 stars). Total Ride: 20 km cycle with gradual ups and downs. Today we witness the visibly dramatic transition of the landscape from the Patagonian Steppe as we enter the Andean range. We start the day by driving to the top of the pass (Paso Cordoba) and the bike riding begins with a fun downhill through amazing rock tower formations. We pass through the tiny “Far West” town of Meliquina and have a tasty picnic lunch in nature. 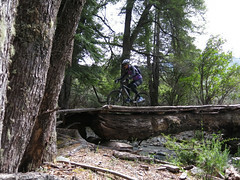 Then, we drive or bike to San Martin de los Andes at the foot of Lago Lacar. Our hosteria is located in downtown San Martin de los Andes, so you can easily explore this cute Patagonian town on your bicycle or by foot. Total Ride: 25 km cycle with 500 mt elevation descent. 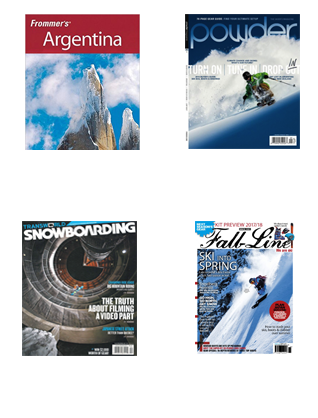 Possible to cycle more. Today we cross the Andes, leave Argentina, and enter Chile! Chile can be described by these words: rainforests, volcanoes, hotsprings, rivers, ocean, and seafood! It is a beautiful country with breathtaking nature all around. 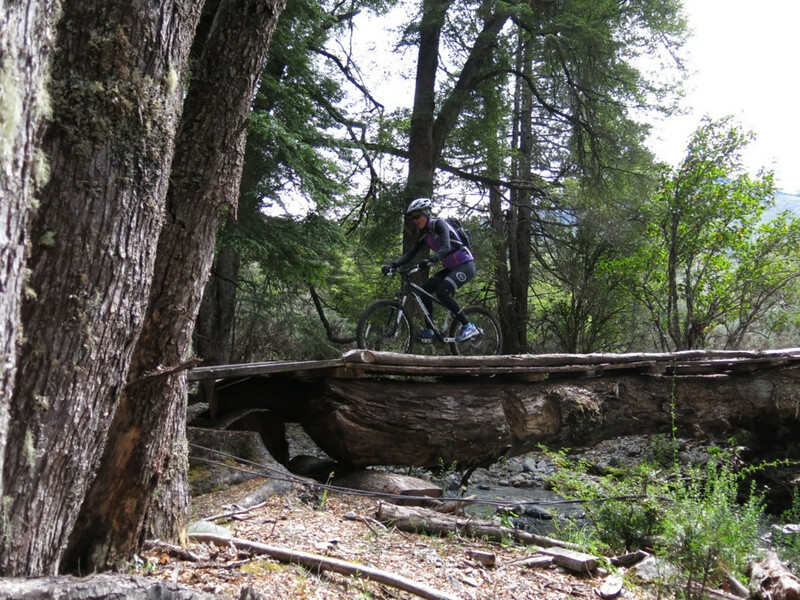 We will mountain bike ride right from our hotel in San Martin de los Andes to the frontier observing the transition of vegetation across Lanin National Park. After customs, we ride another 10 km by van or bikes according to timing with the Ferry that we use to cross Lago Pirehuico. This hour and a half boat ride lets us appreciate the beauty of Volcan Choshuenco and delivers us to Puerto Fuy. 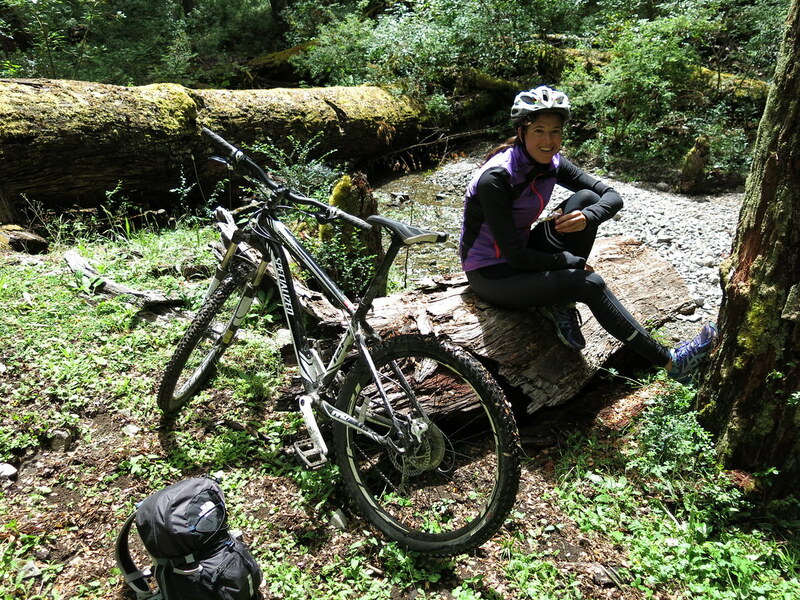 Little bike ride to the small town of Huilo-Huilo after the ferry crossing. Night in a one of a kind hotel, Montaña Magica- Baobab Hotel, that we give endless stars. This “Tree House Hotel” has amazing architecture that fits right into its natural environment. Night in Hotel. Dinner on your own. Total Ride: 35 km cycle with 400 mt elevation gain and 500 mt descent. .
We take an easy morning in this special hotel with its hanging bridges and forest of humongous trees. Optional short hike to the Waterfalls of Huilo-Huilo. 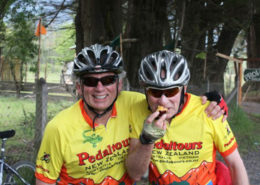 We’ll drive to Termas de Coñaripe and the bike enthusiasts can ride part of the way. Relax in the beautifully landscaped hot springs and eat lunch in the Restaurant of Coñaripe. Van ride to the city of Pucon, the outdoor recreation center of Chile, at the base of Volcano Villarica and along the shore of the lake by the same name. Total Ride: 0- 30 km cycle with 0 mt elevation gain. . 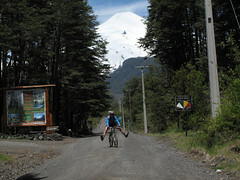 The plan is to ride up with our mountain bikes Volcan Villarica as high as we can (14 km). This is an active volcano that is so high that the top is covered with snow year-round. You’ll be able to see the smoke coming out of the top! 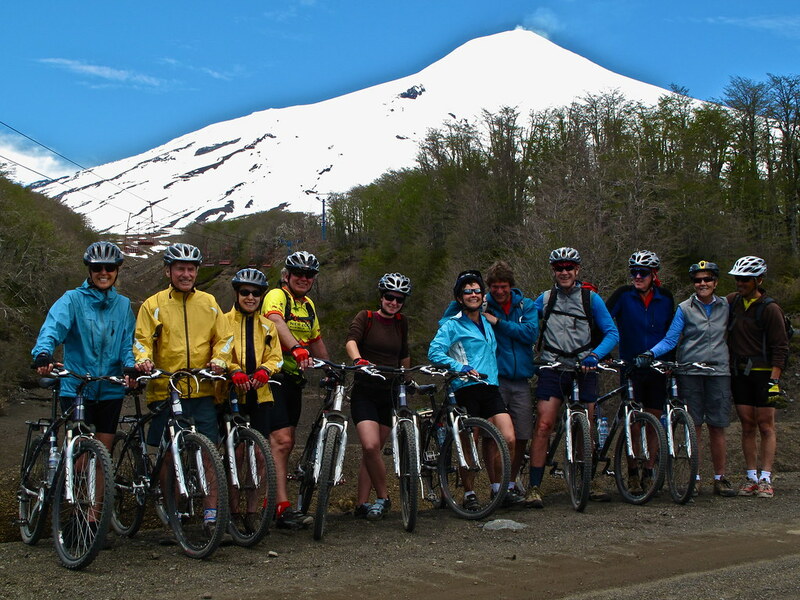 We prepare a lunch for you at the top of the ride at the base snow line.Pictures, relax and enjoy the view of the neighboring Volcan Llaima, and then bike a fun downhill on gravel road all the way to Pucon again! Night in Hotel (3 stars) Dinner on your own. Total Ride: 28 km cycle with 1000 mt elevation change. Today we head back towards the west. 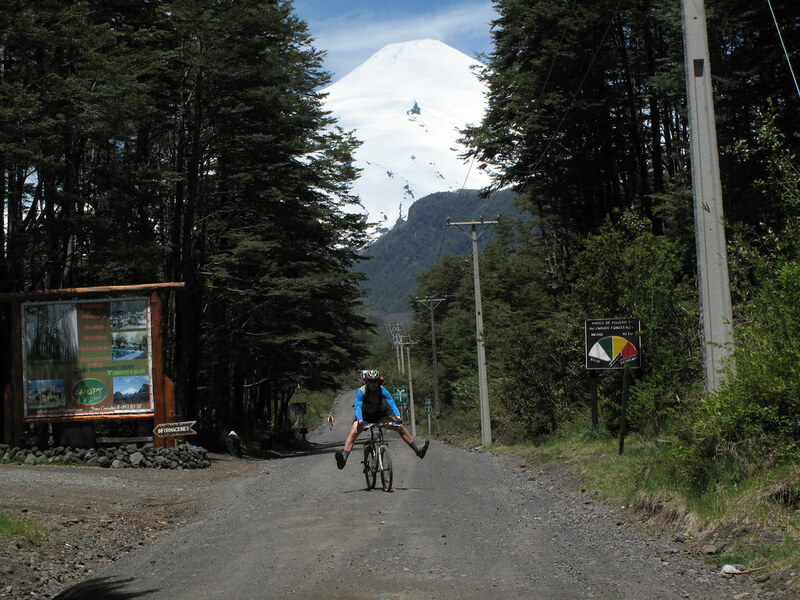 Departing from our hotel in Pucon on our bikes, we cycle a gravel road between the west side of Volcan Villarica and its neighbor, Volcan Quetrupillan. 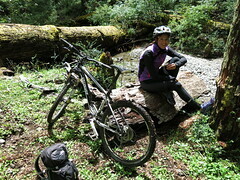 After biking we will have lunch waiting for you close to some waterfalls of the Villarica National Park. Drive to hot springs for a relaxing afternoon and return to Pucon by van. Night in Hotel (3 stars) Goodbye dinner included. Total Ride: 32 km cycle with 500 mt elevation gain. Drive to airport in Temuco or Valdivia according to convenience of the group. We depart early in the morning to get in time to airport. Adios friends and end of services.